Somebody didn't pay attention that the new moon appeared recently. But the stock market attaches big importance to this event. Twenty five international stock exchanges were reviewed and the inference was that daily returns in countries of G7 together (as well as in every separate country of G7) were several times higher at new moons than at full moons. The details about this study may be read in the Harvard Business Review. Is full moon bad for sleeping as well as for stocks? Out: Bear Markets, in: Werewolf Markets? University of Michigan representative, Ilia D. Dichev, and SUNY Buffalo representative, Troy D. Janes, notice that, as the legend says, full moon generates melancholy, doubt and bad luck. So, why it may not be a herald of the deplorable situation for the cash flows. In fact, Mr. D. Dichev and Mr. D. Janes have done an extensive review of twenty five stock exchanges during last thirty years. The results of this research show the stable and enduring correlation between stock prices and lunar cycles. 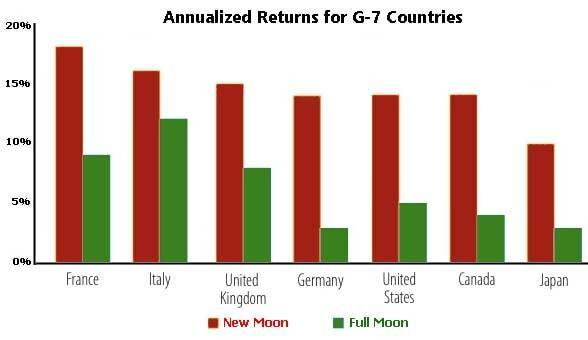 The findings for the countries of G-7 are illustrated below showing that the annualized average daily returns become higher at the new moon than at the full moon. Maybe the chart above makes an impression that the stock market behavior has very odd dependences. But, anyway, these rules do work! Maybe it is not clever to rely for the moon calendar only, but, undoubtedly, it's useful to add this "instrument" to your arsenal and to increases your chances for good luck in such way. More details on lunar calendar available here. Maybe it works better than any other tactic!